During the month of Saga Dawa, the month of the Buddha, the Chinese government is even more repressively trying to control the religious activities among Buddhist students. 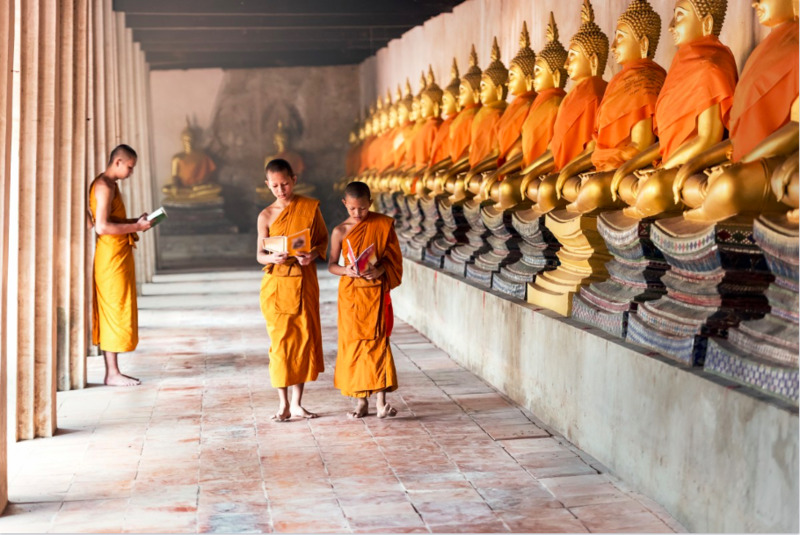 Letters are sent out to parents, asking them to sign a list of rules, including the prohibition of encouraging their children to take part in Buddhist worshipping practices. Another coercive method applied is to send Tibetan students to study in far-away places in mainland China to become uprooted. Over the years, the Chinese Communist Party (CCP) has adopted various means to instill the idea in native Tibetans that their traditional culture and religion are backwards, barbaric and based on superstitious beliefs. In its latest attempt to keep a new generation of Tibetans estranged from their culture, the CCP has recently been issuing notices prohibiting Tibetan cadres, students and parents from participating in religious activities. The authorities have also issued parents a so-called "assurance letter" through their children's schools. It contains six points, two of which specifically point out that during the summer vacation students are strictly barred from joining any kind of Buddhist activities. In fact, such a "notice" is nothing new for Tibetans. In the past, the CCP has consistently issued such bans ahead of every important cultural and religious festival. The Saga Dawa, or Month of Buddha, is an important festival for Tibetan Buddhists. This has put it high on the CCP's agenda. And the regime's Education Department sends regular reminders to schools throughout the province that students are not allowed to participate in any related religious activities. The same holds true for the Lantern Festival, which marks the end of the Chinese New Year in February or early March; the Tibetan New Year Praying Assembly, and celebrations of the Dalai Lama's birthday, which the CCP have outlawed. The 83-year-old Dalai Lama lives in northern India having fled his homeland in 1959. The party has also provided the following list of five rules for the better education of students along ideological lines. First, they are not allowed to go to monasteries to worship the Buddha; second, they cannot attend any religious activities during the Saga Dawa; third, parents as guardians of students are also not allowed to go to monasteries to worship the Buddha or attend any Buddhist religious activities; fourth, all higher-level government departments are asked to secretly monitor and investigate the situation on the ground and deal strictly with those who violate the regulations. And finally, parents who bring students to worship the Buddha or participate in religious activities should be handed over directly to the education board to be dealt with. Parents are "asked" to sign their names at the end of these "notices" so they will have to assume full responsibility for their children's actions. In fact, the notices are more like a secret "agreement" between each school and the parents of the students who attend it, as the parents have to bear all of the responsibility for any "breaches of contract." This marks a change in policy for the CCP regarding Tibetan students, from a partial ban on them attending important religious festivals to a total ban on all religious activities. Moreover, the CCP initially sent thousands of Tibetan teenagers to schools in faraway provinces, completely isolating them from their Tibetan families, culture, religion and environment. This enabled it to directly transplant Chinese ideology into Tibetan classes hosted in cities, towns or villages outside Tibet. The government later implemented a scheme called "Study in Different Places" that sent more Tibetan teenagers away from the Tibet Autonomous Region (TAR) to inland China for further political indoctrination. Young monks are also compelled to leave their monasteries and are still being forced to study at party-run schools. In February 2015, novices in Qinghai province were told to give up their robes and attend government schools after returning home for Lunar New Year. According to official statistics, about 21,000 teenagers from this region are now studying in 22 provinces and cities across China. Outside Tibet there are now 17 junior high schools, 68 high schools and 48 secondary vocational schools running Tibetan classes on the Chinese mainland. Every year some 1,500 junior students, 3,000 high school students and 3,000 secondary vocational school students are enrolled at these classes. Most of them come from the TAR. Yushu Tibetan Autonomous Prefecture experienced a similar situation. From 2015 it began sending 1,000 high school freshmen to various provinces on an annual basis. The number currently stands at 5,000. Moreover, Yushu Intermediate Court handed Tibetan language advocate and local shopkeeper Tashi Wangchuk a five-year sentence on May 22 after he had implored Beijing to better protect Tibetan language and culture, a ruling later denounced by U.N. human rights experts. Meanwhile, Hainan Tibetan Autonomous Prefecture has been running Secondary Vocational Schools in Jiangsu, Hubei, Sichuan and other province since 2013. It has already transferred more than 2,000 students. But despite having "purified" tens of thousands of Tibetan students, the party has still not been able to achieve its goal of exterminating Tibetan ethnicity or culture. As such, it is now exploring new avenues by banning the younger generation and their guardians from experiencing traditional religious cultural events in their own homeland, Tibet. The only religion in China belongs to the CCP, according to Agya Hotogtu, a member of the National Committee of the Chinese People's Political Consultative Conference, the most senior political advisory body in China. "China has only one religion, which is the Communist Party Religion," said Agya, who also serves as the vice president of the Buddhist Association of China and head of the Kumbum Monastery, a Tibetan gompa in Qinghai province which borders Tibet. In order to use the party teachings to "educate" the people, the CCP cannot tolerate the "normal" existence of any religion. It also feels duty-bound to Sinicize the Tibetan nation, which is why it has intensified its efforts to suppress Tibetan religion and traditional culture. With over a thousand years of development in Tibet, Buddhism has become the main body of Tibetan culture and has been integrated into all aspects of Tibetan life. Framed in such a context, it is absurd for the CCP to prohibit Tibetans from engaging in religious activities. For instance, Tibetans have a tradition of spinning prayer wheels, especially when they walk past them in Barkhor Street in the old area of the capital, Lhasa. But can we really say that they are "participating" or "engaging" in religious activities simply by walking along this street? This is absurd logic. The state-run Global Times said recently that Article 8 of China's Education Law stipulates that, "the state separates education from religion. No organization or individual may make use of religion to conduct activities that interfere with the educational system of the state." However, Article 26 of China's constitution clearly states that, "citizens of the People's Republic of China enjoy freedom of religious belief. No state organ, public organization or individual may compel citizens to believe in, or not to believe in, any religion; nor may they discriminate against citizens who believe in, or do not believe in, any religion." Obviously, the CCP's ban on Tibetans' participation in religious activities violates the country's own charter. Yet the CCP ignores this contradiction when it comes to Tibet. The party’s aim is clear: It wants to replace the Tibetan religion with the "Communist Party Religion" so Tibetans can be assimilated with Han Chinese and only "worship" the CCP. In this way, the party can push on with its dream of ruling China for a hundred years.